2018 Results and Video CLICK HERE! Slalom races are held on Saturday of Whitewater Derby Weekend. Racers negotiate a course of gates positioned along the river. Some of the gates require passage straight ahead others require a boat to go through a gate backward and still others require a racer to come back from downstream and go through the gate heading upstream. A penalty is assessed for each gate touched or missed. The racer with the lowest score – fastest elapsed time minus penalities is the winner! A map of the course will be available a week or so before the event – depending on river height and other conditions. Sample Map is below. Racers can elect the NOVICE SLALOM or GIANT SLALOM Races on Saturday. The Novice Slalom is generally easier with gates on river right and racers will not have to cross the river. THE “NOT-SO-WHITEWATER” RIVER RACE CONTINUES! That’s right! A race designed for boaters just starting out or those who already did it all…but maybe a few years ago. 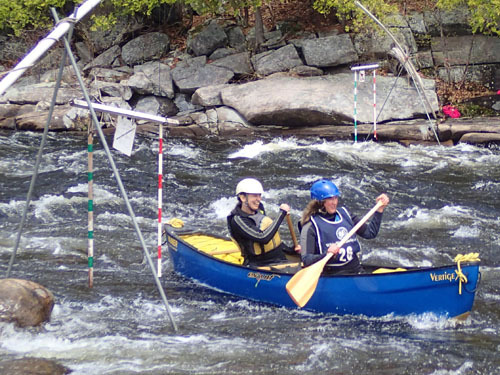 The new “Not-So-Whitewater” race course is 2.5 miles of moving water on the Hudson River just a bit downriver of the traditional Slalom races in North River. 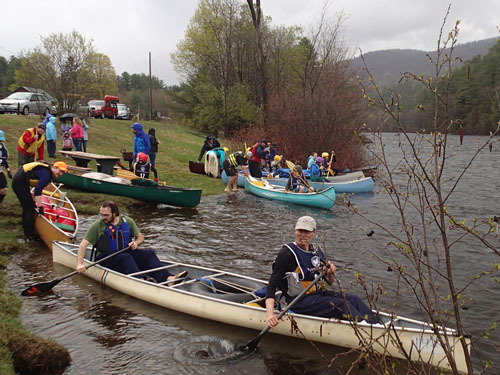 Aimed at appealing to beginner through intermediate level canoers and kayakers, the “Not-So-Whitewater” race starts at the Hudson River canoe and fishing access point 2.5 miles west of North Creek on Route 28 and will finish at Riverfront Park at Railroad Place just downstream of the North Creek Railroad Station. The Not So Whitewater Race will occur on Saturday following the Slalom races. So if you’ve ever thought about giving downriver racing a try. It’s the perfect race to get your feet wet! Also, a limited amount of camping will be available for Derby weekend. Registration and Packet Pick-up is at 9am at the Hudson River Pavilion next to the Train Station in North Creek. Races start at 11AM Awards will be presented in Riparius at the finish line, immediately following the races.